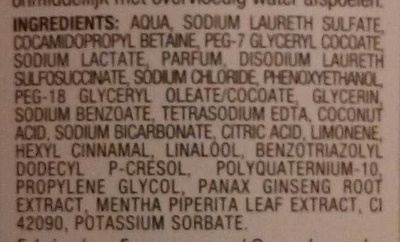 AQUA, SODIUM LAURETH SULFATE, COCAMIDOPROPYL BETAINE, PEG-7 GLYCERYL COCOATE, SODIUM LACTATE, PARFUM, DISODIUM LAURETH SULFOSUCCINATE, SODIUM CHLORIDE, PHENOXYETHANOL, PEG-18 GLYCERYL OLEATE/COCOATE, GLYCERIN, SODIUM BENzOATE, TETRASODIUM EDTA, COCONUT ACID, SODIUM BICARBONATE, CITRIC ACID, LIMONENE, HEXYL CINNAMAL, LINALOOL, BENZOTRIAZOLYL, DODECYL P-CRESOL, POLYQUATERNIUM-10, PROPYLENE GLYCOL, PANAX GINSENG ROOT EXTRACT, MENTHA PIPERITA LEAF EXTRACT, CI 42090, POTASSIUM SORBATE. Product added on February 6, 2016 at 7:08:56 PM CET by sebleouf. Last edit of product page on March 6, 2016 at 5:05:43 PM CET by .